Bates Motel and Haunted Hayride is a Haunted Attraction located in Glen Mills, PA. Team Hallowoosh reviewed this attraction on October 26, 2017. The Bates Motel and Haunted Hayride is arguably one of the most popular attractions in the country. 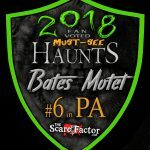 When I decided to learn more about my passion for haunted houses one of the more prominent names that kept coming up was Bates. Being a horror film fan, naturally my first thought was a haunt based around the “Psycho” franchise thinking about the infamous Bates Motel. This attraction offers much more horror than any mama’s boy could give. 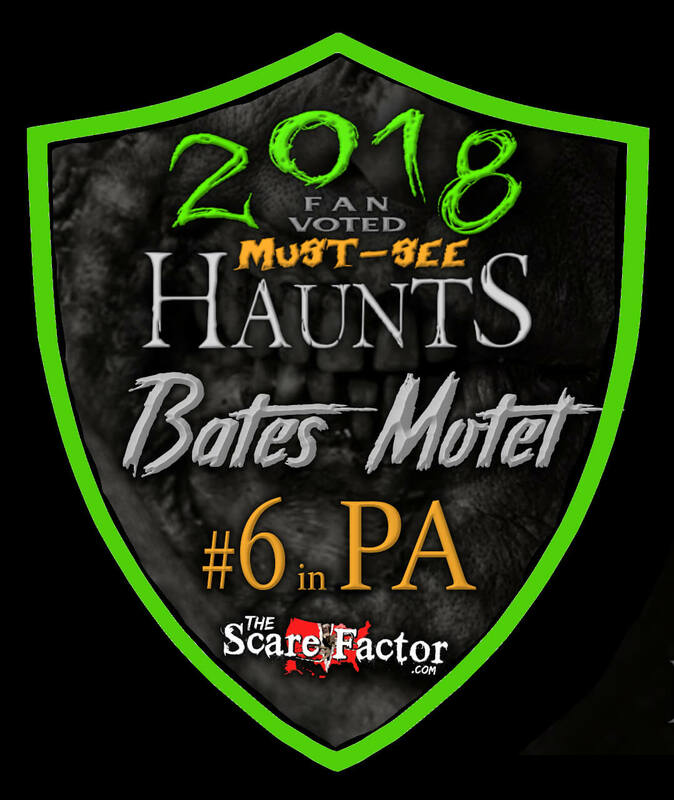 Offering three state of the art attractions; The Haunted Hayride, The Corn Maze, and the Bates Motel itself, this place is not one to miss if you are in the Philadelphia area. The majority of the actors seem to be located within the hayride attraction. The first actor we remember seeing was actually swinging back and forth on a zip line over the whole wagon. She was but a small taste of the craziness that would be coming up at the asylum set. We counted about nine actors all in there respected cells or rooms just going mental. They were throwing dishes around and slamming windows and pretty much anything you would think a crazy person would be doing. Although we really only paid attention to one actor who actually engaged the guests with crazy dialogue while the other looked like they would rather just stay silent and creepy. A short cemetery scene brought forth a few zombie characters. Or at least we thought they were zombies, they could have been ghosts. We were a little thrown off by them when they started screaming “Only the dead belong here!” A little hard to take them seriously when they obviously wanted us out and the only way we were going was … out. Another dead girl either a zombie or a dead woman started laughing like the lunatic characters before her cemetery scene. One actor saved a little bit of face by yelling at the wagon “you’re bodies can leave, but your souls will stay here forever!” Shortly after we bumped into a few rednecks. I’ve grown to like actors a lot more when they can interact with each other. We saw a redneck lady chasing a redneck boy around the wagon trying to get him to stop biting everyone. It was both comical and a little freaky. Truth be told we didn’t have too many other unique interactions with the actors after that point. Everyone was in a good place and did their jobs well but maybe with it being a Thursday night had its effects on who would be coming out. We could tell that the actors knew what they were doing and played their parts of a general scare actor for much of the attraction. Costumes were very appropriate for their themes. Everyone wore the correct attire to match what their characters were all about. My favorite must have been the werewolves in the full wolf body costumes. It is clear though that Bates takes a great passion for the makeup. We didn’t see too many prosthetic pieces but everyone was painted. Whether they were a mangled zombie or a creepy little girl, they all had a style about them that didn’t feel repetitive. Very few masks were in the show. Bates likes to show their actors and their makeup jobs. Bates Motel and Haunted Hayride is located at Arasapha Farms in Glen Mills. Maybe a twenty minute drive outside of Philadelphia. The drive from all directions is easy and clear as there really aren’t many other places on the road that can be mistaken for this haunted attraction. A long strand of lines illuminates the driveway leading to the parking lot. Plenty of parking lot attendants are there to assist. The ticket booth almost overlooks the whole parking lot and therefore it is incredibly easy to find. Many people come to check out the hayride year after year and more often than not skip the two other attractions. The attractions are mapped out in a way where one exit will put you very close to the next attraction’s entrance. So with the majority of the people waiting in line for the hayride and the hayride being the best thing to go through first anyway, it is very clear where you are supposed to go. We waited in line for not too long before getting on our wagon. Being the first ones on a wagon is both a blessing and a curse. At first you get all excited to have your pick of where to sit but then you’re instantly bombarded by everyone else. We tried to ask the ticket taker if they knew which side of the wagon was the best to be on and he gave us a “they come at you from all sides so it’s all the same” Yes, actors aim to get interactive with everyone on either side of the wagon, but I know better than to think each side is equally entertaining. We tried our best to pick a spot that might give us the better show. The corn maze exit brought us to the entrance of the Bates Motel and the exit of the motel put us right in the thick of the midway with a gift shop and a concession stand. This is where we could watch the house light show projecting onto the famous facade of the Bates Motel. Standing tall over the waiting line for the hayride is a big projected screen playing commercials for the attraction and other news segments or documentary type clips for Bates. It does feel a little weird at first because the ticket line is immediately right at the start of the hayride line. You can see where the midway is but it isn’t huge. With the screen playing videos only about Bates and the influence to immediately get in line right after your tickets it feels like everything is rushed. There are a few queue line actors but not too many and to go right in line and wait for a few hours feels like everything is rushed for no great reason. We would have preferred a more subtle approach. Fully knowing we will be standing in line for awhile it would have been nice to walk into the midway and take a look around first and actually feel like something was telling us we are now inside the wildly popular Bates Motel haunted attraction. Instead, it just felt more like someone told us to buy a ticket and then get in line. The hayride goes through the woods on the outskirts of the cornfield. An aspect of the hayride that I think many people enjoy but don’t think about is the change in terrain. Many hayrides will keep it simple and stay on a very flat path. The hayride at Bates feels like there is only a few spots where we weren’t going up hill, down hill, zig zagging through trees, swaying left and right. Not saying the ride is dangerous at all but it does make it feel a little more spooky. The Haunted Motel welcomed us to the Bates attraction with it’s musical light show. The facade of the old western style house complete with a demon’s mouth plays all the classics; Michael Jackson’s Thriller, Werewolves of London, Don’t Fear the Reaper, etc. It’s not a fantastic light show but it’s something fun to watch for a little while. Probably the most popular set of the entire attraction is the big dragon skull in the middle of the castle walls. As many Bates guests know, the crew here like to play with lots of fire. This is where you get your first taste. We drove directly into the mouth of the giant dragon after two giant burst of fire filled the night sky on either side of us. I enjoyed it for a few seconds before the guest sitting next to me had to tell me “that’s what that was” … I spent a good portion of the next several days trying to understand what that even means. Through the dragon’s mouth and past a few of it’s rib bones the wagon made its way back outside where another dragon was waiting for us. This dragon was more alive and hovered above us. The Bates classics are still there with the floating zombie pallbearers coming out of the haunted church. The fire exploding gas station has always been a favorite for many. This year the new effect is absolutely breathtaking. Reaching the end of a new cave tunnel we were all attacked by the massive monster completely made of stone! It towered over us a good eight feet throwing its arms around like crazy and fog spraying everywhere. On the other side of the wagon there was a giant centipede creature that was equally as big. I would say it’s not easy to find many effects inside the corn maze. They do have another swinging actress in a small gothic tomb that has been there for quite a long time. The Motel has quite a few animatronics and some strobe lights. Everything was working properly but nothing too crazy. The Bates Motel and Hayride doesn’t seem to follow any kind of theme. The hayride was put together well enough but the themes jump sporadically. Starting with dragons and quickly moving to a lunatic asylum and then a ghostly cemetery and eventually going into uncharted territory with these cave/rock beings. The corn maze couldn’t even stay with the theme of corn when we quickly found ourselves in a gothic tomb and eventually in a witch’s swamp before exiting. The Haunted Motel is a great and highly detailed haunted house but the Motel part of it is almost non existent. Not surprisingly, the animatronics in all of the attractions are the ones that stick to memory. Particularly the ones I haven’t seen before. The actors did a pretty good job throughout all of the attractions. Many times I found myself trying to pay attention to the animatronics and almost completely ignoring the actors around me. Other times when there was a group of actors it was very easy to pay attention to the one doing all of the actual acting rather than anyone who was trying to get as close to our faces as possible. The Motel was the scarier of all the attractions only because of how narrow and interactive it was. The hayride is a spectacle and everyone loves it. The corn maze had plenty of redneck or southern style creeps in it but nothing that really stood out and scared us. The Motel is in its own light a spectacle as well and I think the distraction of the sights worked very well for the actors. A combo ticket for the Bates Motel, The Corn Maze, and the Hayride is $40. If you wish to only take the hayride, the price is $20. The other two attractions are $15 each. We clocked the time it took us to go through all three attractions and came out with 38 minutes. This gives Bates Motel and Haunted Hayride a minutes per dollar value of .95. If you are ever in the Philadelphia area in October, Bates is worth a visit. Plus they are open almost every day of the month. Only a few of the midweek days in the first week of the month are their days off. There are very few attractions in the world that are open twenty six days in a row!